The final WAHPSA meeting for the year was a great success, thank you to all those who attended. 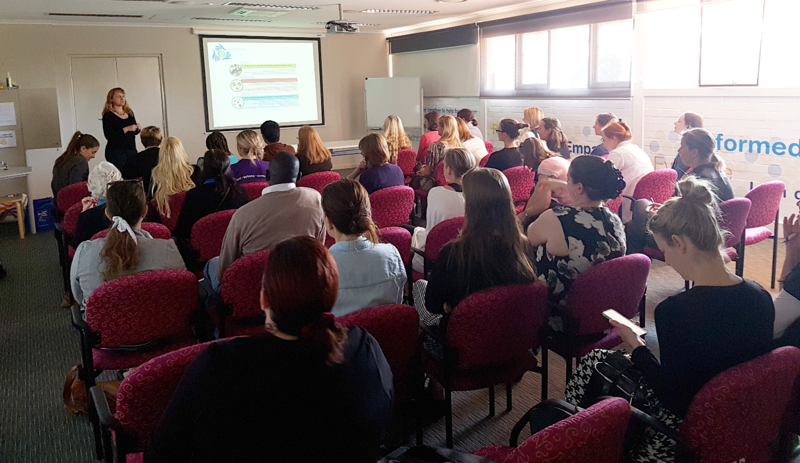 The event kicked off with Sally Blane, WAHPSA President, providing an overview of WAHPSA, including the vision, purpose and strategic objectives, Health Promoting Schools (HPS) framework, 2016 achievements, and what 2017 holds for WAHPSA. We were honoured to have four fantastic presenters, including two school members; Deb Fitzsimons from Cyril Jackson Senior Campus, Rachel Clarke from Bertram Primary School. In addition to this, we had two Academics from the University of Antwerp, Belgium; Dr Charlotte De Backer and Karolien Poels. 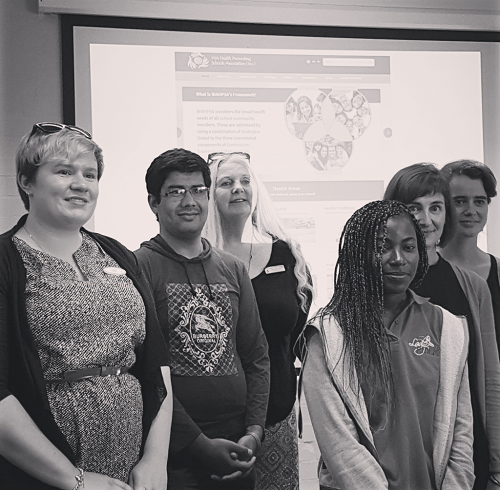 Those attending were given an insight into the health issues present in Western Australian schools, along with the challenges and successors these schools have experienced. The ‘on the ground’ perspective was further supported with two Cyril Jackson students, Ghalam and Tanty, sharing their personal stories. Ghulam, who arrived by boat four years ago, and Tanty both acknowledged that language was a large barrier when they first arrived in Australia. Cyril Jackson Senior Campus is always open to utilising new resources that can help support students transitioning into the Australian education system, and contribute to their learning experience in a positive and beneficial way. Ghulam stated how proud he was to complete year twelve. Similarly, Bertram Primary School also faces many challenges associated with the low socioeconomic status of many of the families, along with the multicultural population. Rachel talked about the schools positive experience with the Stephanie Alexander Kitchen Foundation. The children are actively involved in the growing, preparation and cooking of food. The healthy focus on food education has lead to many wonderful opportunities such as students cooking at the Perth Royal Show, and having calves at the school for three weeks, making education around dairy a very relevant and exciting one! Rachel and Bertram Primary School know first hand the benefits of cooking and gardening have on students, yet identified that getting them into the school curriculum is challenging. Dr Charlotte De Backer, member of MIOS (Media and ICT in Organisations and Society) is currently studying the impact of media on behaviour, in addition to research on interpersonal communication. Dr De Becker’s research has focused on food and how it is thoroughly embedded in our social lives. Key elements of her research covered the domains of social food studies, social talk and interpersonal relations. Dr De Becker emphasised on the importance of family meal sharing. Meal sharing corresponds with psychological wellbeing, joy and performance at school. Eating together is a sign of a strong bond, intimacy and healthy social behaviour. When people eat alone they often turn to distraction such as reading, working or using their mobile phones. In doing so, people tend to consumer more food later as they don’t get the psychological association, and therefor satisfaction as they would without media distractions. Dr De Becker approached producers of a popular Belgium children’s cooking television show ‘K3’ and worked with them to ensure the content of the show included healthy nutritional messages that encouraged children to make their own lunches, influenced by the healthy messages they were engaged with on the show. A sound example of health promotion and the commercial industry working together. Associate Professor, Karolien Poels, research assesses the nature of cyberbullying, and the ways in which Nordic countries, in particular Finland, reduce the incidence and impact of cyberbullying. According to Poels, cyberbulling is much like traditional bullying yet with additional features such as; the victim being vulnerable 24/7, visible to other groups, bystanders can react and participate, and there is more opportunity to operate in anonymous ways, although most of the time the bully and the victim are known to each other. In response to the findings, an evidence based interactive game was developed in effort to tackle bystander behaviour in the context of cyberbullying. This resulted in Friedly ATTAC (Adaptive Technological Tools Against Cyberbullying). 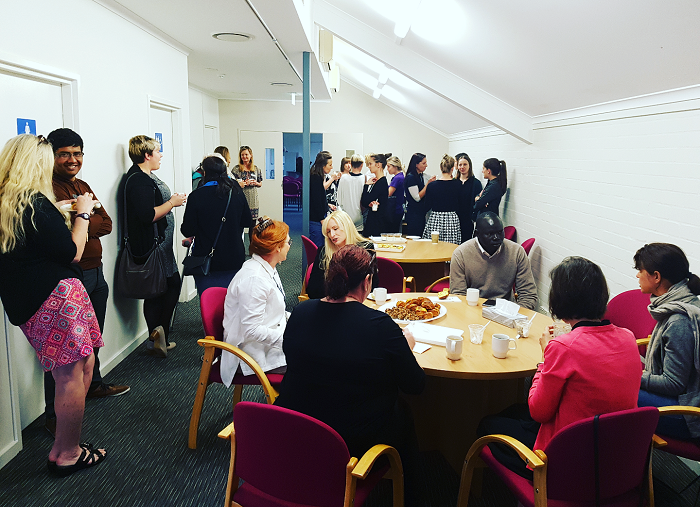 The event allowed for open discussion, and was followed by a delightful breakfast where the room was ‘a buzz’ with energy as guests had the opportunity to network. Sally Blain, WAHPSA President welcoming attendees.